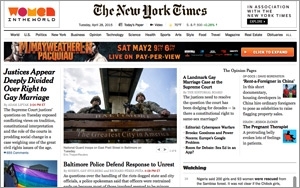 The total number of unique visitors to newspaper Web sites and apps increased 10% from 161 million in March 2014 to 176 million in March 2015. Newspapers are also seeing the net reach for their digital content increase across almost all age groups. For all adults over 18, newspapers’ net reach rose from 78% in March 2014 to 83% in March 2015. Among men ages 18-24 it increased from 68% to 80%, among men 25-34 from 84% to 87%, and among men ages 35-44 from 75% to 84%. Likewise, among women ages 18-24 newspapers’ net digital reach increased from 73% in March 2014 to 84% in March 2015, for women 25-34 from 84% to 92% over the same period, and for women 35-44 from 82% to 92%. Furthermore, for women ages 45-54 it increased from 78% to 83%, whereas for men in this age set the net digital reach remained even at 80%. Previously, U.S. newspapers reached a then-record-setting 173 million unique visitors in January 2015, according to comScore and the NAA -- up 19% from 146 million in January 2014, and 4.8% from 165 million in December 2014.